Welcome to exploring the..."aesthetic-precepts-smashing, eyeball-massaging, brain-searing-with-its-heartbreaking-and-fragile-beauty, visually-apocalyptic" side of art, style and architecture? While you may think that we exaggerate here (well, only a little), you are welcome to assume that you will be assaulted with purple prose, strange "red-shifted-into-impossible" facts, and images... well, images lurid enough to shimmer through your eyelids and trigger an iridescent neural zeitgasm! - all for the sake of breaking from the boring and mundane and promoting the "weird and wonderful" side of things. Seriously though, this column is not going to be earth-shaking in the way we described it, but don't say we did not warn you... you may still find yourself lost for some time in the ensuing cataract of pictures and information, unable to complete your study and work commitments. For those of you, who want an even larger dose of our visual caffeine, head over to Dark Roasted Blend site, and get addicted to our endless stream of thrilling visual information. Might I add, that our "visual caffeine concoctions" are bound to be somewhat unpredictable as we explore history of art and architecture in tandem with mythology, culture and obsolete technology, seeking to find the overall "look and feel" of certain time periods. The goal here is to connect as many points of reference in art history as possible, highlighting little-known gems, visual styles and trends - and making them relevant in our caffeine-infused culture. 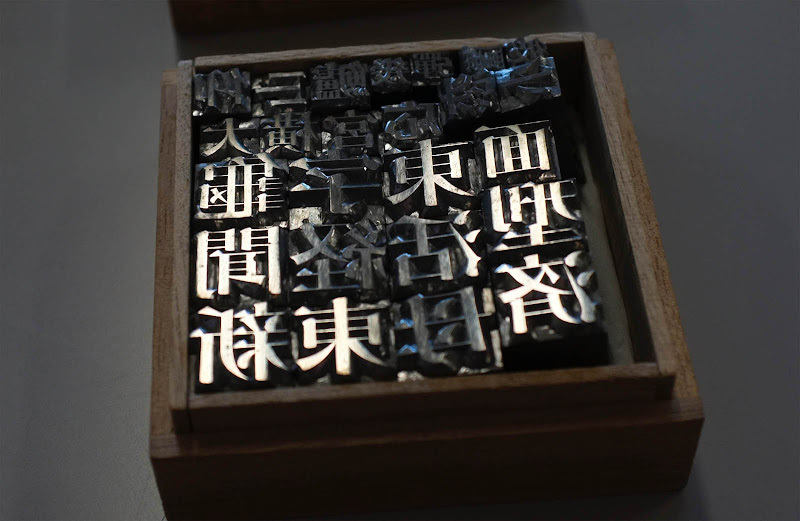 Craft letterpress companies are experiencing a revival in recent times, and nowhere it is more evident than in Japan. 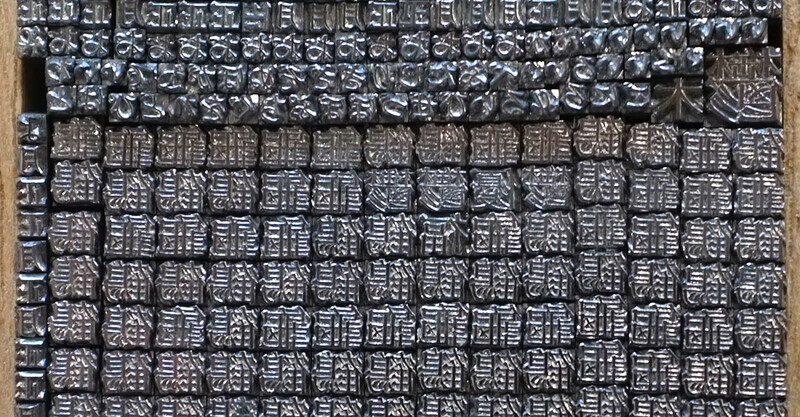 Most of you will be familiar with the ancient Chinese and Japanese art of woodblock printing, but masterpieces created with wood and metal movable type are somewhat lesser known, although they show craftsmanship and attention to detail similar to fine woodblock prints. The first movable type and printing presses were invented in Asia, not Europe. ...but their development stalled because of the extreme complexity and sheer number of Chinese and Korean characters (the same problem that the Asian cultures faced with the transition to typewriters and the internet). We can thank the simplicity of Western alphabets for the rapid development and adoption of the printed word in Europe, which quickly lead to the Renaissance and further advances in culture and education. It is a widespread misconception that Johannes Gutenberg created the first movable type system and the printing press, around 1450 A.D. It's true, Gutenberg was the first to make his movable type from a certain alloy of lead, tin, and antimony (which was more efficient than iron, used in Asia) - but movable type itself was originally invented in China around 1040 A.D. by Bi Seng (during the Song Dynasty). 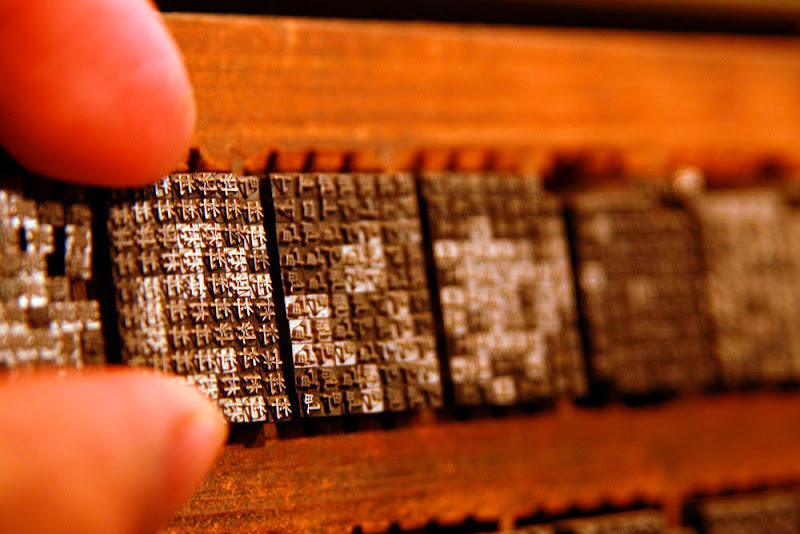 The new system was badly needed to replace the labor-intensive woodblock printing technique, where a single wooden block was carved to represent a single page. 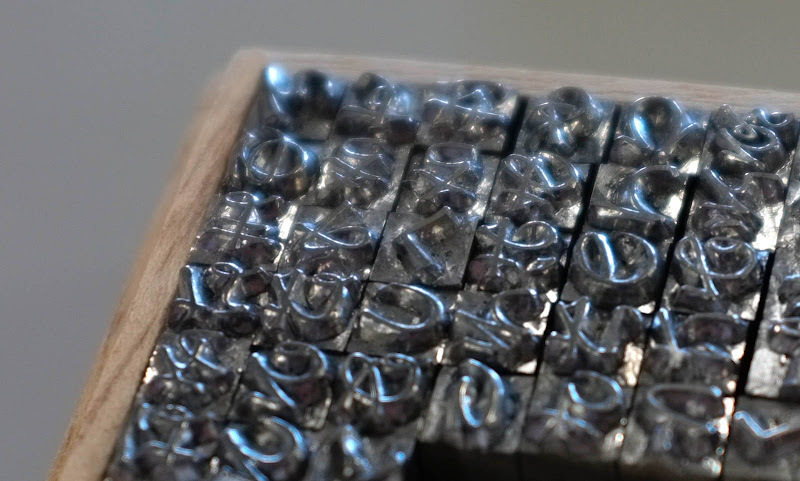 The first movable type sets were made from wood or ceramic materials, with clay eventually replacing wood "due to the presence of wood grains and the unevenness of the wooden type after being soaked in ink". As you can see, just reading this sort of printed material (not to mention assembling movable type and actually printing it) requires intense concentration for our Western minds: it's hard to simply glance on this page and "speed-read" it. One needs a certain serendipity and discipline of mind to read long Asian texts - consider, for example, how you would feel reading the massive 1000 volume encyclopedia "Imperial Readings of the Taiping Era" printed in 1574? "A potential solution to the linguistic and cultural bottleneck that held back movable type in Korea for two hundred years appeared in the early 15th century — a generation before Gutenberg would begin working on his own movable-type invention in Europe — when King Sejong the Great devised a simplified alphabet of 24 characters for use by the common people, which could have made the typecasting and compositing process more feasible. Try typesetting in Japanese and learn attention to detail! 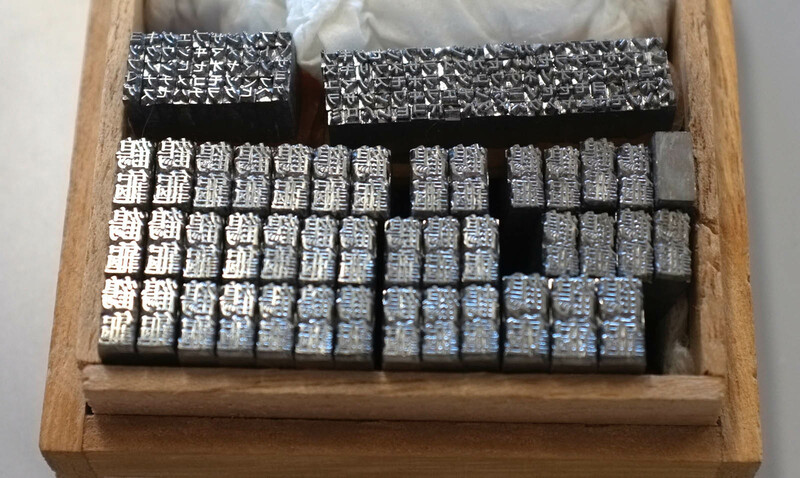 So how did Bi Seng, the movable type inventor himself, group his type and find the proper pieces? He organized them by "rhyming groups"... turning the printing process into a sort of poetry. Interesting alternative to organizing information by the alphabet, but perhaps not as efficient. "You have to remember each place for each word - it's about 400,000 characters, can you imagine!.. Too many. Some of them are set in alphabetical order, and then kanji characters are categorized for each kind. It's hard to remember it."